There are certain moments in life when you are literally stopped in your tracks by something you see. It might be intriguing or even seemingly impossible, but whatever it is, you definitely take some time and try to understand what you saw. Most things have reasonable explanations, but other objects or events definitely need a second look. The images below are worth checking out, and you will be surprised and even shocked by some of them for sure! People have all kinds of jobs, and while some of them seem to be a piece of cake, others can be really stressful, which is why they require highly trained professionals who earn a lot of money. Such positions are not for everyone, and this screenshot proves that it takes a special kind of person to do the work. 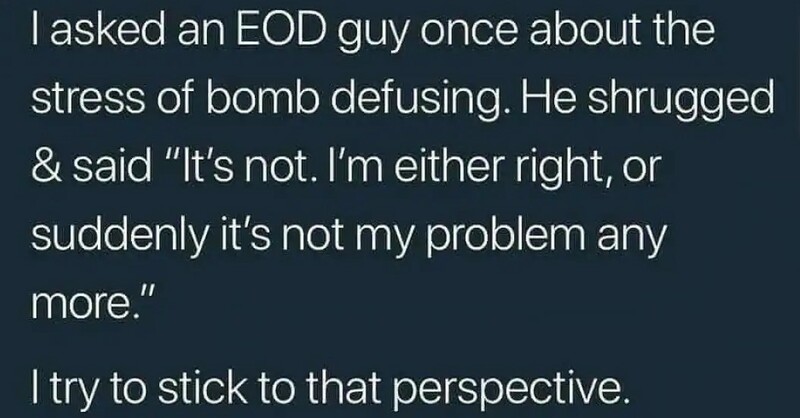 The EOD guys are obviously some of the toughest and bravest employees, because they risk their lives on a daily basis. As you can see, these guys have it all figured out and they accept their duties in a very positive way. There is an old movie entitled Maximum Overdrive and it is based on a story written by the Stephen King. The story was about a comet that caused all machines to turn against the people. For some reason this move was our first association when we saw this cash register machine. 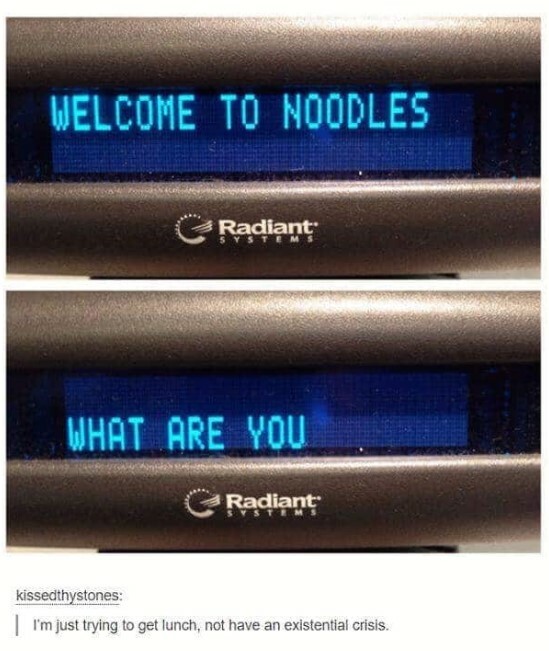 It is kind of funny to see a cash register starting a conversation with a customer, and we would immediately feel curious if such a thing happened to us. We wonder what would happened if someone typed a reply to the question? Maybe the conversation with a cash register machine could be a nice one, who knows? In fact, we believe that the machine would have a lot of nice stories to tell after meeting so many people at the store. Here is a situation that raises quite a few questions. This photo shows just two benches and plant in a pot between them. However, it turned out that there was something curious happening in the picture. 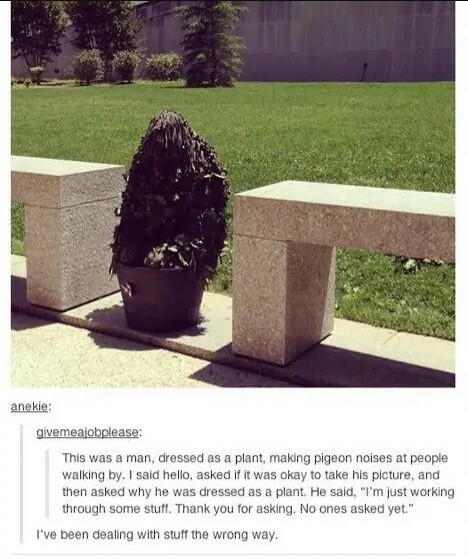 The plant is actually an extremely well-camouflaged dude just sitting in the pot and imitating pigeon noises for some reason. 4. Who knew that sauce packets had feelings? Hopes and dreams are obviously not reserved only for human kind. This woman was probably very surprised to find this sauce packet behind her microwave. We can all see the heartwarming message that was written on it. 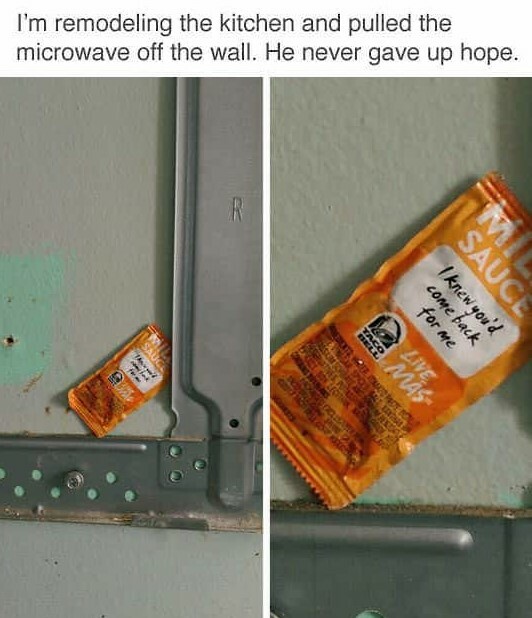 This is something great, because nobody would expect to see a positive quote or affirmation written on a sauce packet. In this particular case the message was more than appropriate, and the woman was probably very amused by the whole thing that happened. Imagine that you are driving on a busy highway and you suddenly see something that you have never seen before. In some cases these things look so unreal that you start wondering if you witnessed a glitch in the matrix or not. 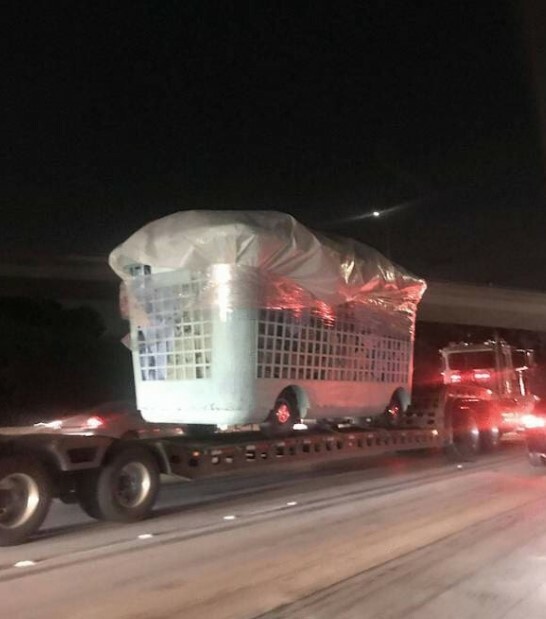 Seeing a laundry basket with the size of a bus is definitely one of those things, and we cannot help but wonder why it even exists? Maybe it will be used for a TV commercial, or it is going to serve as a decoration of a big store. When we were kids, we used to put pennies in our mouths. It was a strange trend, but it happened a lot. Now we are adults and we find it hard to understand why someone would actually do it. However, it seems that we are not the only ones who have done it. Someone decided to put the most unusual pizza topping we have ever seen! 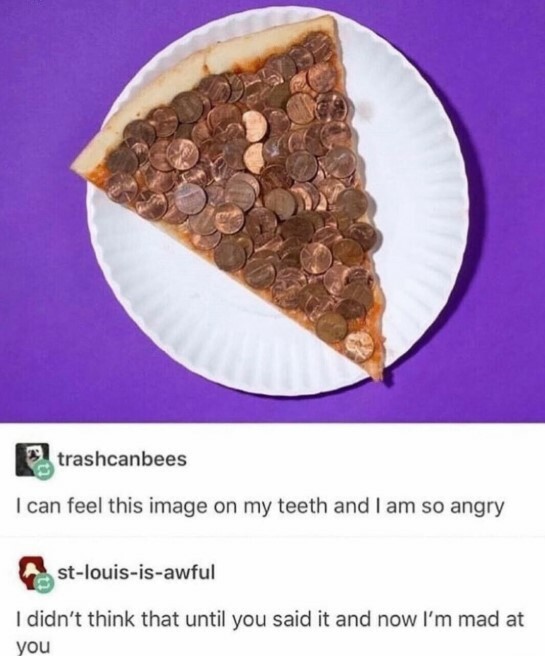 These coins do not look too bad on the slice of pizza. The whole thing looks like an art installation, and we guess nobody would like to take a bite. When it comes to having a meal, there are a lot of options available. You could have something traditional, or you can have a quick snack. There are fast food locations literally everywhere which offer all kinds of yummy things. However, some folks take meal prepping to the extreme, and this photo is a nice example! 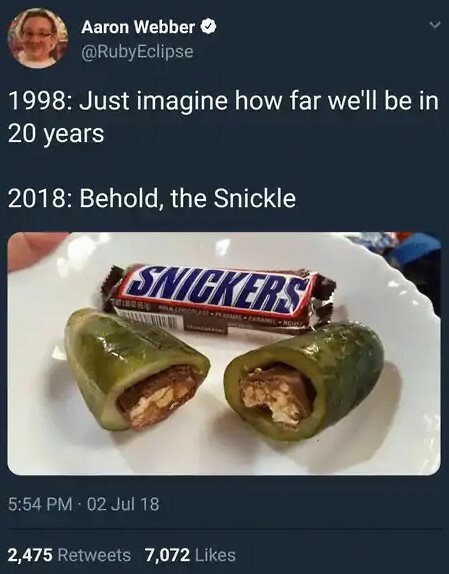 Combining a Snickers bar with a pickle would probably be a real sensation for the taste buds in our mouth, and we would try it for sure! What we like about the internet is that there will always be plenty of funny things to amuse us. 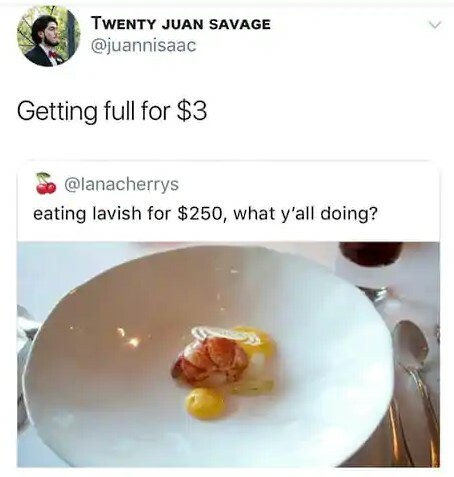 When this user decided to brag about enjoying a lavish dinner, the expected outcome was probably different than the actual one. 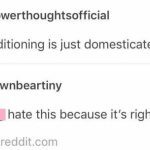 Someone commented on the post and literally shut down the person that was bragging, and we could not agree more. The food worth $250 seems to be insufficient to satisfy most people’s cravings, and you could always have a couple of burgers for a fraction of that price. Have you been in a situation when you just realized that someone broke into your vehicle? The feeling is not very nice, but it could have been worse. When the initial disappointment passes, all that you need to do is evaluate the damages. This was probably the moment when this dude noticed that everything was normal and there was nothing missing. 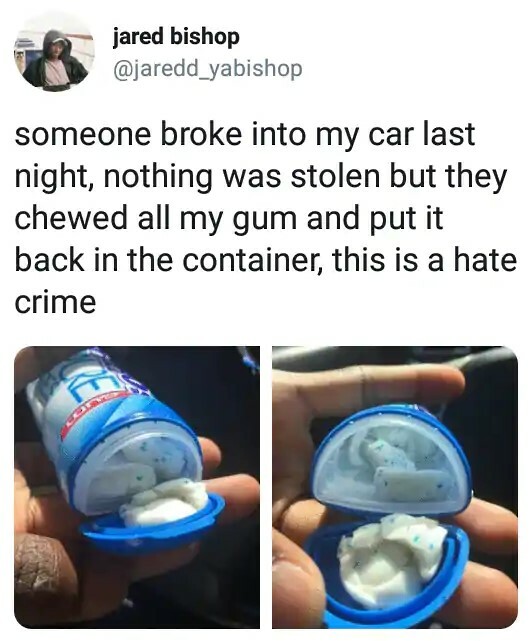 At this point the vehicle owner was probably very happy, until he saw what happened to all of his gum. We are sure that it was nothing more than a prank. If you haven’t seen Pokémon, this would be really hard to explain, but chances are that you have seen it. This cute dog had no idea what was about to happen, but the owner did! 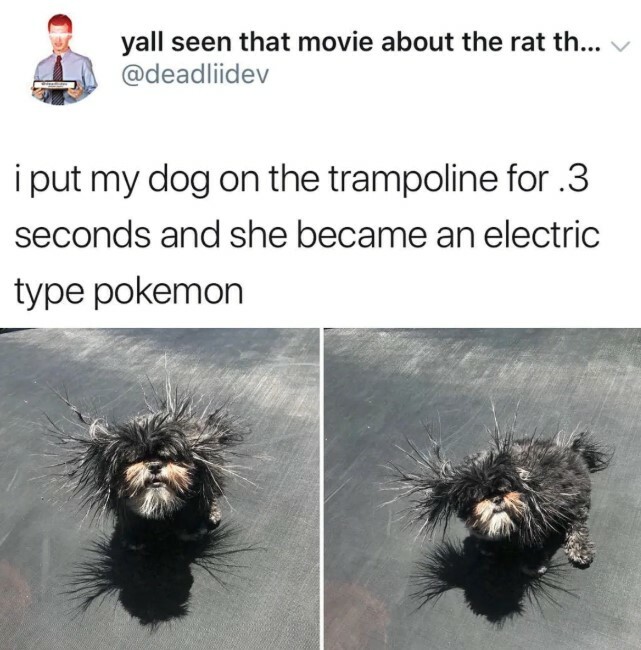 All the bouncing on that rubber trampoline charged it with static electricity, and the little dog immediately experienced its effect. This is a fun way to combine some family fun with science. This perfectly timed photo made us all laugh! Someone was able to capture it in the best possible moment, and we like to see perfectly timed photos like this one. 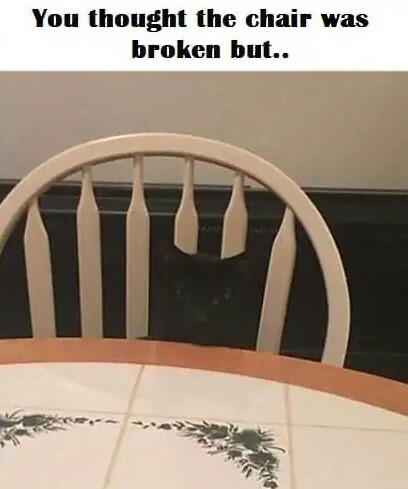 The hilarious way that the cat created the illusion of a broken chair made is laugh. Those among you who have cats know how goofy they can be sometimes. The black feline in the photo looks like it wants something in particular and we guess it was food. You never seem to have a power bank when you need it, which can be annoying. This is especially true when you need to document something important on video, or at least take some photos. However, there is always a solution, and the guy in the background of this photo found one when he needed. 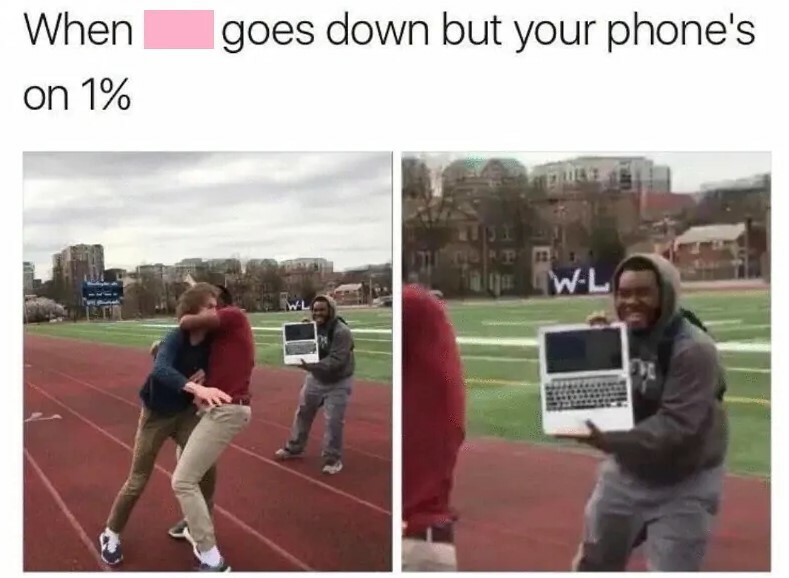 If your phone battery is down and you do not have a tablet with you, you could still use a laptop! Sure, it looks weird, but the bottom line is that you will be able to get the job done. It is all well when it ends well. We all know that almost every store has a strict return policy, and you need to be familiar with if you want to successfully return an item. However, you could still be able to get away with something as crazy as you see in the photo here. Someone obviously returned an item that was bought from the very same store almost two decades ago! 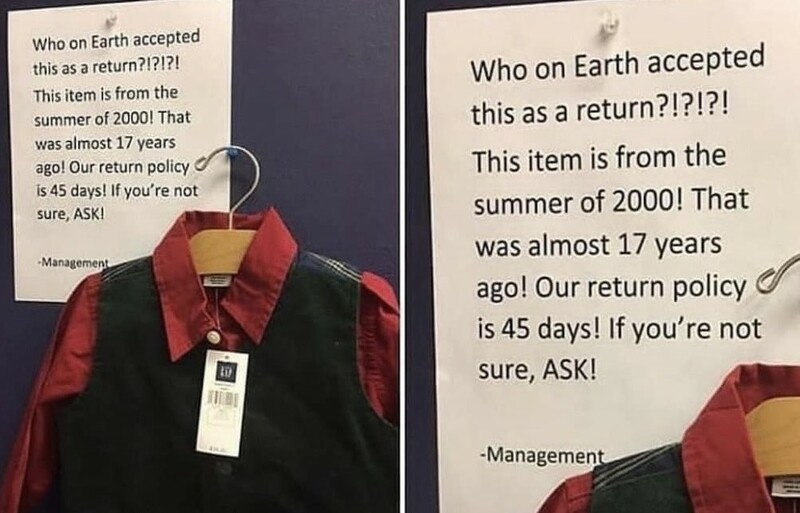 This was possible only because the employee was new or the item resembled something from a new clothing line. Whatever the case, we find it to be really funny, and the customer who returned it probably had a lot of courage! 14. Have you ever seen a more daring escape? 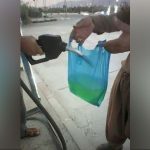 This may seem to be a bit weird, but it is still something you do not see every day! 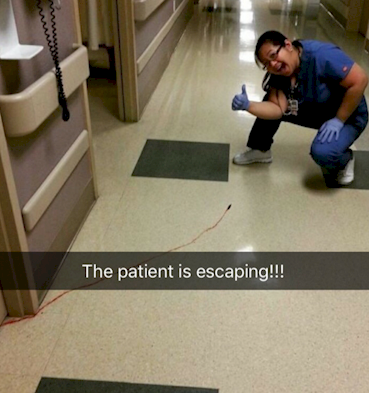 What you see is a medical leech trying to escape from a hospital room. As you can see, there is a thin blood line behind it, and the staff member posing with the leech was probably puzzled about the whole thing. Maybe they put it back where it belonged immediately after taking the photo, and we are glad they snapped the pic. This is surely one of the strangest fugitives we’ve seen on the run. If we were there, we would cheer ad encourage the leech to proceed with its escape plan.